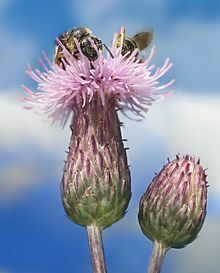 Cirsium arvense is a species o Cirsium, native throughoot Europe an northren Asie, an widely introduced elsewhaur. The staundard Inglis name in its native aurie is Creeping Thistle. This page wis last eeditit on 2 Apryle 2017, at 00:02.